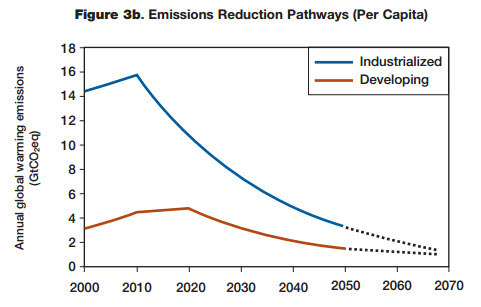 Exxon: "Rising greenhouse gas emissions pose significant risks to society and ecosystems." Shell: "…CO2 emissions must be reduced to avoid serious climate change. To manage CO2, governments and industry must work together. Government action is needed and we support an international framework that puts a price on CO2, encouraging the use of all CO2-reducing technologies." BP: "According to the Intergovernmental Panel on Climate Change (IPCC), warming of the climate system is happening and is caused mainly by the increase in greenhouse gas emissions and the increasing concentrations of greenhouse gases in the atmosphere. Results from models assessed by the IPCC suggest that to stand a reasonable chance of limiting warming to no more than 2˚C, global emissions should peak before 2020 and be cut by between 50-85% by 2050." Chevron: "At Chevron, we recognize and share the concerns of governments and the public about climate change. The use of fossil fuels to meet the world's energy needs is a contributor to an increase in greenhouse gases (GHGs)—mainly carbon dioxide (CO2) and methane—in the Earth's atmosphere. There is a widespread view that this increase is leading to climate change, with adverse effects on the environment." These companies no longer easily fit the stereotype of “Merchants of Doubt”, at least when it comes to the basic science of climate change. The denizens of "skeptic" climate blogs and the majority of Republican Party politicians will find little in the way of support for their anti-consensus views on the climate webpages of the big oil companies. Nevertheless, the damage done to the public perception of climate science by the GCC and other oil-company-sponsored organizations lingers on. In the 1950s and up to the mid-1970s, seven big international oil companies (IOCs), known as the Seven Sisters (who have since merged into the four companies Exxon, BP, Shell and Chevron), controlled about 85% of the world’s oil reserves. No longer. The National Oil Companies (NOCs) now control 55% of the world’s production, 88% of the reserves and the IOC’s today have full access to only 15% of the world’s reserves (see this EIA report for details). The “Big Oil” oligopoly is over. Today’s world oil business is run by governments, and not usually by democratic ones. Such a huge reduction in consumption would price high-production-cost oil (e.g., deep water, Arctic, tight oil) out of the shrinking market. The future reduction in demand would have to be achieved by some kind of carbon pricing, so that the high-carbon-emission oils such as the Alberta oil sands would be preferentially squeezed out as well. IOC’s today are increasingly focussing on high-operating cost, carbon-intensive oils marketed to industrialized nations. The world in 2050 will not be a big enough place to accommodate both a thriving oil industry and a stable climate. I propose that the reason for this is because individuals tend to come by their beliefs through intuitive, emotional responses (Daniel Kahneman’s fast brain), which they then use their reason (slow brain) to justify after the fact. Furthermore, they then stick to these beliefs, partly as a matter of solidarity with their cultural group, regardless of how much more they learn about the science. Countries and corporations, on the other hand (paraphrasing Charles de Gaulle), don’t have friends or emotions; they only have interests. A corporation’s key interest in a competitive market is to maintain the confidence of its shareholders, customers and employees, a goal that the IOCs evidently—judging from Lord Browne’s speech quoted earlier—considered to be incompatible with a transparently self-serving tactical rejection of the consensus of scientific experts. Although some of the oil company climate action statements may appear to the cynical to be mere greenwash (i.e., PR promises devoid of content), some actions have produced real results, notably efforts to reduce methane leakage. A recent paper in Nature by Simpson et al (2012) (paywalled but see also the article in Climate Central) linked observed declines in atmospheric ethane to reduced fugitive emissions of methane (and associated ethane) from oil and gas operations. Simpson and her colleagues estimate that this may have reduced methane emissions by 10-21 Tg/yr (million tonnes per year), and that this could account for 30-70% of the total decline in methane emissions since 1984. If true, this would be the only climate mitigation action ever to have shown results detectable at the Mauna Loa Observatory. On the other hand, atmospheric methane concentrations have recently started to climb again, perhaps due to recent increased rates of shale gas drilling. As a good example saying one thing yet buying the other, ConocoPhillips has donated ~$500,000 this election cycle, with >90% of which going to Republicans. Thanks, Andy S: This is a process that, for those who follow the behind-the-scenes, not-oft-reported-in-the-MSM news, shows how Big Oil, in no particular fealty to the IPCC, couldn't, and can no longer. reject out of hand the data showing that climate change is real, it's beyond likely we've caused it, and what the 'maths' are, as to its consequences. It's long been among BO's loudest and most raucous supporters, and as such, BO's seeming reversal (really just an acknowledgement of the science we all ahve been trying ti illuminate) will cause the fake skeptics heads to ~detonate~ as BO continues on towards their next goal, to corporatize and populaize alternative energy. It could be argued this is a bad or good thing but that's not my point: Mine is to see what happens to the Watts. the Moncktons, the Christys, and the Spencers, as BO begins to actually operate in *precisely* the way the denialists' would least like, i.e., to do SOMETHING towards decarbonising civilisation. I read your loaded adjectives & pointed hyperbole & wonder how it's possible you overlooked the 49 NASA Scientists & Astronauts that deplore the "agency's activist stance" toward AGW & use the term "neglecting empirical evidence" that calls CO2's role in GW into question. Do a google: 49 NASA Scientist's letter, read it yourself! Moderator Response: [DB] Your comment is off-topic on this thread. As Robert Murphy notes, this was covered on this SkS thread, here. Please post any further comments on that subject there, after acquainting yourself with this site's Comments Policy. Do a google: 49 NASA Scientist's letter, read it yourself!" Moderator Response: [DB] Any wishing to respond to LaughinChance, please do so on the most appropriate thread. “…they then stick to these beliefs, partly as a matter of solidarity with their cultural group, regardless of how much more they learn about the science." I think it would be more accurate to say, “regardless of how much more they hear from science.” They are not interested in learning. That requires an open mind and a willingness to learn. They are determined to defend their emotional and intuitive beliefs. Please do not be too disappointed if the anti-science echo chamber only becomes louder. Likewise I hope you will not be too disappointed if the oil companies do nothing to actually help reduce GHG emissions and continue to develop ever more oil fields. Soon the demand to open ANWR, the Alaskan National Wildlife Refuge, to oil exploration will overwhelm the resistance to it; especially if Romney wins. If you haven’t seen it yet the Frontline Climate of Doubt site is an excellent resource. If you are interested in learning about how the climate change countermovement is now secretly funded you should see what Robert Brulle has to say. 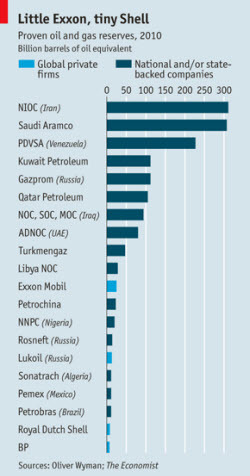 For the oil companies it is all about appearance. It is no longer about active opposition because the secret opposition and secret funding is more than sufficient. Of course they will do nothing to actually put an end to their enormously profitable industry. Sure they will no longer obviously fund denier organizations but they will fund the politicians who will vote against any attempt to reduce CO2 emissions. Sure they might try to reduce methane leaks but they will still open up more crude and natural gas plays. The two big petroleum industry news stories for this week: The US may soon become the world’s top oil producer, and due to a deal with BP the Russian oil company Rosneft will now rival Exxon Mobil in oil and gas production. More production out of Africa, more production from the Arctic, more pipelines for the tar sands, more, more, more. It is just too early in the fight to be optimistic. Well, this will be a political comment, and as such, it possibly contravenes the comments policy, and you may certainly delete it. So, reading from your table above, Monckton, Watts, Delingpole etc are actually arguing for the interests of Iran (Ahminejad), Saudi Arabia (the ibn Saud and bin Laden clans), Venezuela (Chavez), Kuwait, Gazprom (Putin),etc., etc. etc., until, in 11th place we get to them good old boys from Texas, Exxon. "Vote for me! I'm against all advice from the US military (eg. NASA, eg. US Navy), but I stand shoulder to shoulder in the fight against the "global warming hoax" with my good old buddies, Ahminajad, Ibn Saud + bin Laden, Chavez, Putin and, in 11th place, Dubya." Chevron has come out swinging! $2.5 Million donated to House GOP superpac in the single largest corporate post-citizens united donation. And do these tactics ever appear to be working; Climate Progress reports that Congress has voted 109 times in the last 18 months to enrich Big Oil.